In 'The Second Lay of Guthrun,' the poet makes sure to remark that Guthrun does not cry over Sigurth's body. In... was it the First Lay?... she does not cry, until another woman suggests that she kiss Sigurth's dead lips. She does, and then she weeps. In my telling, I've been sticking with her 'not crying,' and extending that motif - she doesn't cry when she prophesizes her brothers' death, doesn't cry when she sees them die, and doesn't cry as all the Huns mourn the death of her sons. And the meaning of that seems to change over the course of the piece, and I'm not sure if it's in a good or a bad way. It seems to me that, the first time we hear that Guthrun does not weep or tear her garments as other women do, it's meant... positively. She is strong, like a man is strong. It's the old dichotomy of women/weak, men/strong; women/cry, men/stoic; ergo cry/weak, stoic/strong. Yet by the end, as she watches the hall burn with all its dead within and still does not cry, she really seems more like a sociopath. Women/cry, not-cry/not-woman - what was laudable earlier suddenly gets twisted into unnatural woman. It's good to have manly qualities, until it's not. Motherhood, ur-womanhood (or so it is assumed), should trump whatever manly virtues she possesses. When it doesn't, she's not-a-woman, or wrong-woman, or broken-woman. I am trying to address this by specifically calling out her love for her children, even as she killed them. She loves them, but she hates Atli more. It hurts her, but her desire to hurt Atli is greater. I am trying to show that she is not a soulless monster - no more than her jealous brothers who killed Sigurth. She is human and frail and does a horrible thing, but not without regret or remorse or pain. Just not sure it comes through. What if... what if she did cry? Oh oh! When she jumps into the sea, I can say something about the ocean being her tears! Suggesting her deep and boundless grief while maintaining her eerie tearlessness! Ooo, I think I like that! Saturday was Storvik Performer's Revel, and on a lark I debuted 'The Tale of Guthrun' - a prose recitation of her story that I hashed out in the car on the way over. I was able to incorporate a good number of call backs to the poetry ('as greater than other men as the leek is greater than the grass,' etc) and it got a really good reception! I had opened by saying that I don't normally do storytelling, and when I finished, someone said, "You should do it more often." 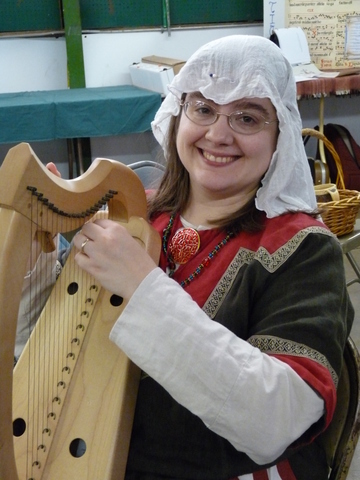 Yesterday, I also tried telling the tale with my harp in my hands. Mostly open fifths, home and away, with pauses in the tale for longer melodic riffs. I think it worked pretty well! I'll try lyre next. There's so much I like in parts of the Second Lay of Guthrun and the Atlikvitha that I'm looking at smooshing them together. The Second Lay is told in the first person (in Guthrun's voice - and that's so perfect for me), so I'll need to tinker with the Atlikvitha passages. All the bits that take place in Burgundy can get cut, but I need to put something in about her and the ring with the wolf's hair. I need to reaaaaaally think about the climax. As it is currently, the listener is, like Atli, kept in the dark about the "young game" being served until it is too late. That's very effective, but does it explore the themes I said I wanted to explore? The Poetic Edda has some very powerful pieces in it, so much so that I think I want to make those into a performance, too. I realized that I was starting to turn this into an almost Shakespearianos soliloquy, "Is this a dagger which I see before me, the handle toward my hand?" style. And I don't think I can support that. What I can support is a backward-looking lament. "Woe, woe, these are the things that happened to me." It's such an understated style, most of the time. Wulf and Eadwacer is possibly my best model, with its mix of immediate emotion and backwards-looking observations. Thinking of highlighting the parallel between the death of her brothers and the death of her sons (who are brothers). So, I got a copy of Lee Hollander's translation of the Poetic Edda. Geez, when people said he was using deliberately archaic language, they weren't kidding. I'll stick with the Victorian! On the other hand, he's got a lot of good notes and more recent scholarship in his foreword, on the dating and such. The Atlikvida gets put at about the 9th century. I am not particularly worried about justifying the use of the material in an Anglo-Saxon context. Unless you believe that Wulf and Eadwacer is about Signy, the Niflungs and the Volsungs aren't represented in the Old English literature. On the other hand, other elements of the great Germanic myth-cycles are (e.g., Beowulf wearing armor forged by Weyland; Weyland referenced in the poem Deor; and famously, "What has Ingeld to do with Christ?" I suppose it's possible that there's a Norse/English connection but no English/Germanic connection, but I don't really believe that. I can't prove it right at this moment, but I'm pretty certain of it. I also had an interesting conversation with my husband on art and artists in the Middle Ages and today, coming out of some of the ideas I've gotten from the Practice (nee Performance)-Based Research class. He wanted to emphasize the importance of patronage to the artistic process of yore; I acknowledge it, but I also think that individual artists were more than just mouthpieces for patrons. Slowing starting to wonder what the problems being researched in "Practice-Based Research" are. I had assumed it was matters pertaining to the performance itself? As in: using practice and self-examination, we will research what works and doesn't work for our arts. Now from what I'm hearing, I think it might be more along the lines of "Can people be made to do/be/feel XYZ if the artist does ABC?" Still not entirely sure. I've read through a bunch of pieces at Sacred-Texts.com, including the three lays of Guthrun and the Greenland material. The Atlakvitha almost gives me the sense that killing her sons was something she did sadly - that she still loved them, but she hated Atli more. So to hurt him, she killed them, even if it pained her as well. I don't get so much of that sense from the Atlamol. The Bellows translation has some archaic phrasing to it (thees and thous) which isn't my favorite thing. Also, I like to double-check the Victorians. ...there, got a copy of Hollander's translation for Kindle. I can read it on the airplane tomorrow. In the first lay of Guthrun, there's a repeated stanza about how she doesn't cry. That idea gets picked up in one of the other ones (one of the Greeland pieces? gah, should have noted it) as a sort of a callback. Her brothers are dead, her children are dead, and she doesn't cry. So I have the feeling I missed the point of this week's assignment. We were supposed to write our project goals in first person, then in third. Mine were identical statements of work covering the stages of the project I have in mind: historical research, poetry-writing, musical composition, performance development. Some people in the class who already know what autoethnography is have made some helpful comments explaining that it's sort of more like psychoanalyzing your work. Or your approach to your work. Or... something like that. I'm hoping it'll make more sense when I see some examples. So, in service to that: Why am I drawn to Gudrun, and specifically to the scene of child murder and cannibalism? It's not a very nice scene, after all. Ever since I started looking farther into Anglo-Saxon literature, I've been very interested in the women in it. Most of us have Beowulf sometime in school, and the whole Saxon/Viking/Dark Ages era is shown popularly as Grr! Argh! What's in your wallet? sort of barbarism and violence. And yet - we have female voices singing passionate love songs, weeping with broken hearts for their dead, making war, making love, making mistakes and winning victories. And I want those voices to be heard, because I hear them and I think they have important things to say, and I want to share those things. And, okay, killing your children isn't sane or good. But is that really the best we can do for understanding? Call her a monster, call it a day. Because monsters aren't people; they aren't me. I wouldn't do that. Never. Ever. It's too scary, I think, to contemplate that you might. That yes, there might be something, some event or confluence of events out there that would drive you to that same dark place, the freezing mere of Grendel's dam, from which you emerge a monster. It's powerful stuff, it's relevant today, and it was relevant a thousand years ago. Let's hear it sing. Indeed, my copy of the Niebelungenlied was Penguin, and a good thing, too! It had plentiful endnotes that helped resolve why Gudrun would be angry that her husband-slaying brother was killed. The later 'complete' tale of the Niebelings was a mash up of two earlier lays: The Death of Sigmund and The Death of the Niebelings. In the earliest versions of The Death of the Niebelings, Gunnar doesn't have Hagen/Hogni kill Sigmund. Sigmund's not in it at all. It straight-up starts with Atli/Atilla inviting Gunnar and Hogni over to visit, and Gudrun tries to warn them not to come. There's no murder to forgive. Atlakvida is the oldest extant version of The Death of the Niebelings that I think there is. It's in the Poetic Edda, which is 13th cen., so not sure why Penguin had it as a 9th cen? The events in it are depicted on a runestone dated (according to the Internet!) 8th-12th cen (nice range). Maybe they used the language to date the poem as being older. As well as the individual poems listed on the Codex Regius page. So I've signed up for a free online course through Stanford on "Performance-Based Research." I'm still not 100% clear on what the course is about, but I'm a performer and I research, so this should be good, right? It's also tempting to do it as a short narrative. I think I will not do this as a translation, per my usual. I'll review a few sources (I have one copy of the Nibelungenlied, I think a Penguin translation, and Tolkien's 'Sigmund and Gudrun. '), decide what I want to emphasize, and focus attention there. As a mother with two small boys, I tend to want to really hit the horror of her revenge while - if I am clever - not demonizing her. I think I don't want to slip in modernisms about post-partum depression or psychosis - I'm not John Gardner, this isn't Grendel. Review the dates for the Huns and for the composition of the various sources and pick lyre or harp. No idea what I'm going to base any accompaniment on; I'm reviewing Sequentia's website for inspiration. Not that I can fit their decades of experience into ten weeks but it's a start, yes?